According to the great Danish physicist Niels Bohr, “Anybody who is not shocked by quantum theory has not understood it.” It is without doubt the most intriguing scientific theory of the twentieth century and one of the pinnacles of human intellectual achievement, and yet the vast majority of people are unaware of its power and beauty. 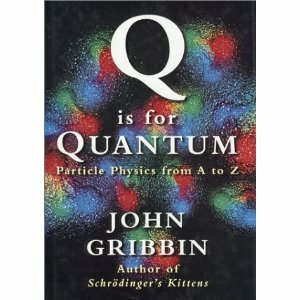 If you have always wanted to know the difference between a quark and squark, or get confused when it comes to bosons and wimps, or talk about cosmic strings when you mean superstrings, then John Gribbin’s “Q is for Quantum” might be a useful guide to the mysteries of the quantum world. Ever since it was formulated, quantum theory has been at the centre of controversy. “If this is correct, it signifies the end of physics as a science,” said Albert Einstein, and Erwin Schrödinger, one of the founders of this revolutionary view of the world stated that, “If all this damned quantum jumping were really here to stay, I should be sorry I ever got involved with quantum theory.” Quantum theory caused such consternation because it defies common sense and goes against everything that scientists have previously believed. For example, in 1906 J.J. Thomson received the Nobel Prize for discovering the electron and showing that it is a fundamental particle, but in 1937 his son G.P. Thomson won the Nobel Prize for showing that the electron is a wave. Ultimately quantum theory resolved this conflict by identifying the electron as an entity which can exhibit both wave and particle properties, so-called wave-particle duality. Furthermore, the theory asserts that when two electrons are heading towards each other, then it is impossible to predict the outcome of the interaction, even if we have complete knowledge of the two electrons, i.e., the universe is not deterministic, merely probabilistic. Although quantum theory is bizarre, it appears to be a true and accurate description of reality. Because it describes nature at the most fundamental level, it is at the heart of a whole series of scientific breakthroughs in areas as diverse as cosmology and the unraveling of DNA. In addition to influencing pure science, quantum theory is also responsible for many of today’s most important technological breakthroughs, such as lasers and silicon chips. Indeed, it can be argued that without quantum theory, billion dollar industries, such as computing, would not exist. Gribbin is a gifted populariser of science, who tells stories with enthusiasm and explains physics with clarity. 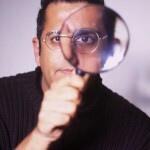 He is also prolific, having published over 70 books. However, this book does not give Gribbin the opportunity to fully exploit his talents. As the title suggests, “Q is for Quantum” is a reference book, packed with definitions, explanations, and biographies. As a reference book, it is excellent. Alternatively, if you want to read a coherent narrative describing the creation and evolution of quantum theory, or if you desire a lengthy discussion of the philosophical debates which followed, then you should look elsewhere. Not surprisingly, Gribbin has already written just such a book – “In Search of Schrödinger’s Cat”.